Kelly and I were recently featured in an article by Sarah Topp with the On The Ground program with the Michigan United Conservation Club. Thanks for the nice article, Sarah! Link to the article is below. 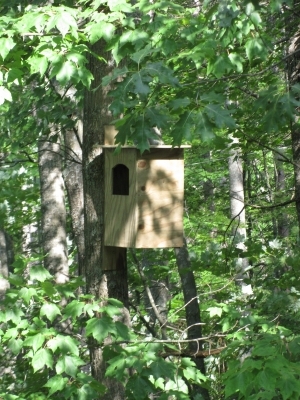 A nice weekend up north at the Hootch provided an opportunity to finally place the owl houses built. After careful selection of the trees and locations, my Dad and I were able to get the owl houses that we built last year posted on some sturdy trees. Let others hunt first – Courtesy goes a long way when hunting with others. Offer the “fresh field” to your fellow falconers. Willingness to share the game – Even though it’s your hawk/falcon that took the prize, you might want to offer part of your kill to the other members of the hunting party who helped you beat the brush. Each of these areas of falconry requires a serious understanding of the legality of such activity along with the moral and ethical considerations that go along with it. If you have some other ideas or suggestions for the falconry code of honor between falconers, please be sure to post a comment! 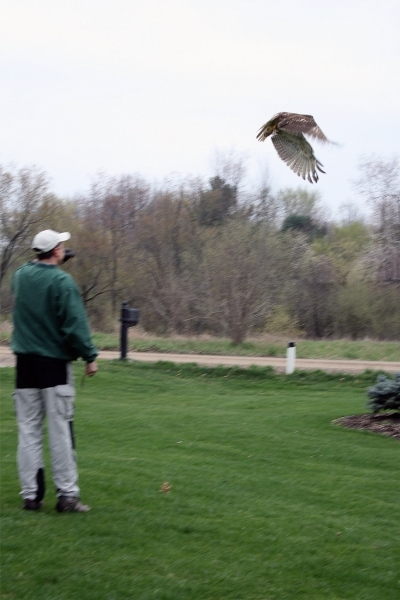 After 6 months as a falconry bird this season with Sable, I was grateful to return her to the wild this weekend. 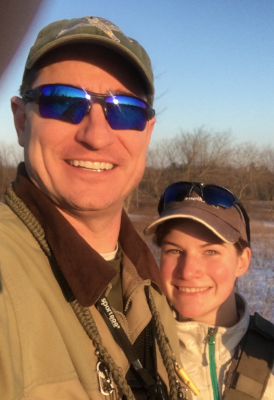 With just about a half-season of hunting together, we had to take it easy for the remainder of the winter to heal the injuries sustained from hard hunting in the wild over the Christmas break. She healed up alright, and will be sure to succeed in the wild, I’m confident of her abilities. Sable was a very gentle, mild mannered Red-Tailed Hawk who took to manning quickly and was quite the successful hunter earlier in the fall. She never made an aggressive move toward me and was a perfect apprentice bird for a second experience. She was instantly successful with our first hunting exercises and took to squirrel hawking quite naturally. I will miss the best parts about her as the next chapter in my Falconry book turns. With the release of my first bird, Tahoe last year, this picture (above) seems to be a tradition, as our family gathers together to say goodbye to the hawks we treat as guests in our mews and with our family for the season. It is a bittersweet moment in the course of a falconer’s experience with any bird, I suppose. It also provides a learning opportunity for my family as I hope to show my boys how to care for and respect the wild animals that inhabit our earth with us. A bird has been trained and captured from the wild has grown accustomed to the the company of a human hunting companion for a period of time, and the set free to return to the wilderness from which she came. Sure, they are not ‘pets’ like a cat or a dog, who appreciates the master and interacts socially, looking for praise and companionship. Raptors are solitary creatures and show no affection to their falconry hosts. At best, they might respect you, but you only serve as a meal ticket in their eyes. Nevertheless, it does not prevent the human condition from growing attached ourselves to these beautiful, wild creatures. It is the feelings of admiration and respect for them that provides for the personification of our hunting partner; we give her a name, call her out in the field, describer her attitude in human terms, and care for her as gently and as lovingly as we can. After all, If I didn’t love them and appreciate these wonderful animals as much as I do, I wouldn’t be a falconer. September 3rd, 2011 is International Vulture Awareness day. It’s also interesting to note that I see Turkey Vultures almost every day where I live. Not just one, or two; hundreds. I can look up in the sky around my house and see at least 10 at any time. Why so common around Lake Orion? The Eagle valley waste management facility south of Lake Orion on Lapeermight have something to do with it, as they congregate here in kettles by the hundreds. Click here for a link to the IVAD home page.